Today, it seems that our schedules are more full than ever. We schedule each moment of our day so that we can fulfill all our responsibilities just in time to fall into bed and get just enough sleep to do it all over again. If we get one bad night of sleep, it is often extremely difficult to catch up due to our busy schedules and the difficulty that many have falling asleep and staying asleep. For this reason, Mattress For LESS strives to offer the citizens of the Waterbury-area high-quality, affordable mattresses, beds, and bedding. We are proud to be part of the Waterbury community and have a store located within its city limits. We want to help those who live in Waterbury—our neighbors—have a good night’s sleep whether you are sleeping in on a Saturday or you are sleeping before a long workday. Though there are often other factors that are often at play that cause us restless nights of counting sheep, often the root of the problem lays in the quality of our bedding and mattresses. 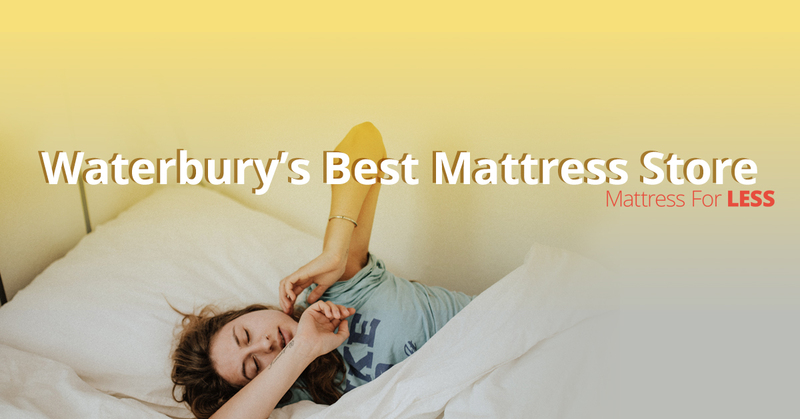 Mattress For LESS is the Top Rated Local® bedding store in Waterbury. Being the best mattress store in the Waterbury and surrounding areas means that we offer mattresses and bedding products from the most popular and respected brands, such as Sealy, Sealy Posturepedic, Therapedic, Kingsdown, Eclipse, Eastman House, Solstice, Body Fit, AmeriMattress and more. We understand that one size does not fit all and that not all beds fit the needs of each partner. Shop our inventory online or stop into our Waterbury store and let one of our associates help you find what you need. As we mentioned above, we offer high-quality and affordable bedding from respected brands such as Sealy, Sealy Posturepedic, Therapedic, Kingsdown, Eclipse, Eastman House, Solstice, Body Fit, AmeriMattress and hand-tufted mattresses from Eastman House’s Traditional Collection. We provide traditional mattresses in all sizes including specialty sizes like Full XL (special order) and Twin XL; our inventory of adjustable base mattresses are extensive as well. Click below to shop online! We are a mattress store that is your one-stop-shop for all that you need to create a bed that is not only a comfortable place to sleep, but also a relaxing refuge. We offer headboards, bed frames, mattress protectors, pillows, and more. At Mattress For LESS we strive to not only provide comfort options and high-quality, affordable mattresses, headboards, and other bedding, but also provide financing options. We want everyone in Waterbury to have a comfortable mattress and so do not require any money down, credit, and provide zero percent financing and other payment options. Contact us if you have any questions! Shop our Waterbury Store on 751 Wolcott Street and discover the difference that Mattress For LESS offers so that you can sleep well tonight and every night. Click below to shop online or visit our Waterbury location!